All four of my children LOVE apples. And they have all been learning about apples at school, so it seemed like a good time to go to an orchard! I spent quite of bit of time online and on the phone trying to find an orchard that was open during the week, wasn’t too picked over, and allowed children to pick apples. Let me tell you, it was no easy feat! Apple orchards are hard to find. 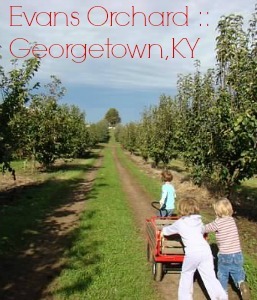 I finally found one that met all of our needs, the Evans Orchard & Cider Mill in Georgetown, Kentucky. 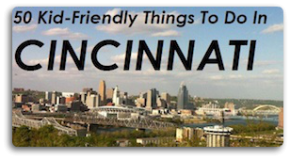 And if you are up for a road trip with the family I highly recommend it! There was so much to do at this farm that we really could have stayed all day.Our focus was the orchards of course, and we spent most of our morning wandering through the rows and rows of over 20 different kinds of apples. The rows were all marked, and they gave me a paper telling me what was in season and what different apples were good for. The kids loved the experience, the branches were low enough for them to pluck the apples, and they loved tugging the baskets and the wagon along. There were so many trees in their orchard that we had no problem finding trees that weren’t too picked over. We ended up with 3 baskets full of apples and paid $30 for them. We also visited “Animal Land” which was Evans Orchard’s version of a petting zoo.While the cost made me gasp at first ($4 per person – even adults – and $1 for food) I totally think it was worth the cost!It was really well maintained, and had such a great variety of animals. We saw a camel, llamas, ostriches, goats, cows, chickens, a fox, tortoises, a lemur and even a kangaroo! Usually I am not a big fan of petting zoos…but this one won me over. You could make a day of Evans Orchard! I did look at the pumpkin patch, and it appeared well stocked, but we didn’t pick pumpkins on this trip. They also have a playground area that they charge $5 per child. 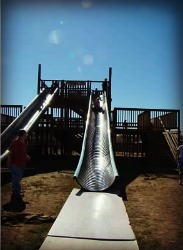 It is a HUGE play area, and the kids had so much fun…it’s a playground like no other! During our visit there were several school groups at the farm, but it wasn’t too crowded, and the school children do not visit the orchards, so we had them to ourselves (we went on a weekday).Evans Orchard also has a store and a café chock full of apple products. All of the staff I encountered on our visit were so sweet, and were more than happy to answer my countless questions about the orchard. I give this orchard an A++, and I think we will definitely go again.It was worth the cost, and worth the hour-long drive. yours. I appreciate you sharing your blog with us. Hi Katie, loved your post on the apple orchard. I’ll need to plan a road trip there. Great pics too! Now, what are you going to do with all those apples??? ?